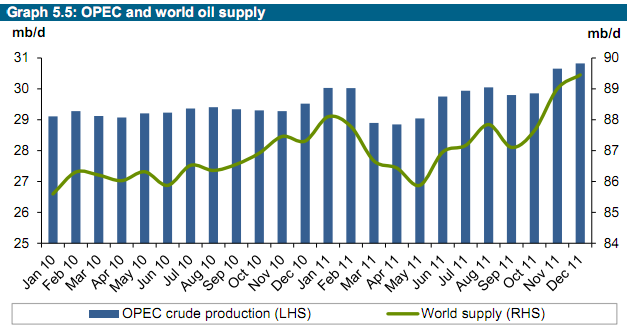 Global oil production rose by about a half million barrels/day in December according to OPEC. So fears over Iran, Nigeria, Kazakhstan remain largely just fears - not that something couldn't happen, but so far global liquid fuel production is still rising. 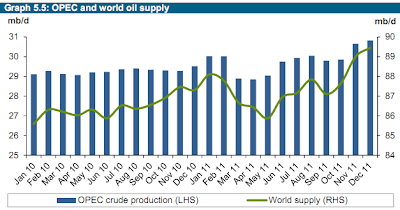 The IEA will come out with their numbers on Wednesday and I will update all my monthly graphs at that time. According to OPEC (based on "secondary sources") Saudi production was pretty much flat over the November level: 9.763mbd in December versus 9.783 in November. Still no sign of the 10mbd Mr Al-Naimi was claiming. Meanwhile no sign of any gas tax rise in the US, not even the slightest discussion about it. Full steam ahead towards total economic suicide and resource wars remains the mantra(while publicizing energy independence being possible at the same time), let's go ! Reading into that OPEC report some, especially pp 31-39, they really blur the difference between crude oil, natural gas condensates, other fossil fuel-derived liquids, and even biofuels such as ethanol, which I saw mentioned at least once in that section. One wonders just how long all the other increased liquid fuel production can make up for the crude oil production stagnation and at what price per barrel? YvesT: a second comment of yours has been deleted as being inflammatory and derogatory while adding little value to the conversation. Please make comments in a constructive spirit - thanks.